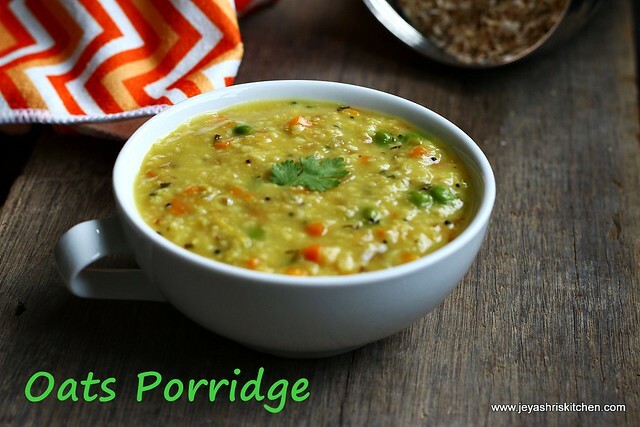 Oats porridge is a simple and easy breakfast recipe. 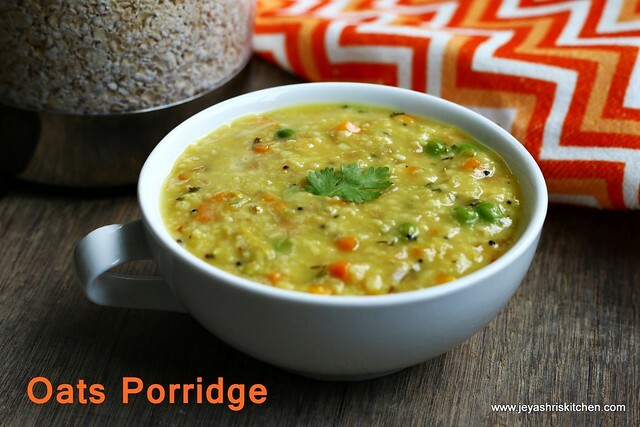 Bachelors or students who stay away from home and are bored with the routine bread and jam and cornflakes for breakfast can try this easy and simple Indian style Oats Porridge. Even for people who are on diet and weigh watchers can make this for their dinner . You can make this porridge for a evening snack too. I myself had this many times even for lunch or dinner also. 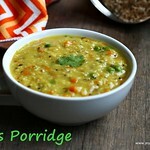 Let me share this easy Bachelor recipe – Indian style masala Oats porridge. Chop the onions, carrots finely .You can grate the carrots too. Slit the green chilli. In a pan add oil and add the mustard seeds and green chilli. 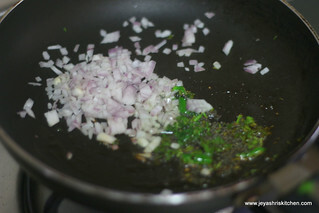 Saute for few minutes and add the coriander leaves too. 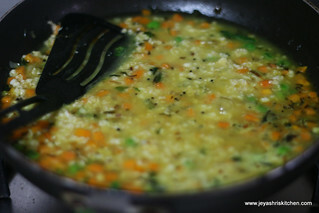 Adding coriander leaves at this stage will enhance the flavour of the porridge. 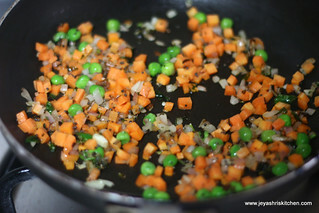 Add the carrots, green peas, turmeric powder and salt. 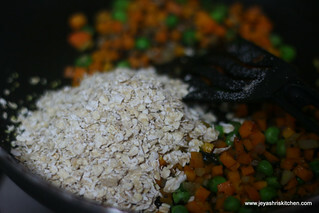 Add in the Oats and add 1and 1/2 cups of water. Keep cooking for 5 minutes in a low flame. the Oats will get cooked fast. Stir in between. Adjust water according to the your preference . Switch off the flame . Serve it always hot. This porridge serves as a filling breakfast. Red chilli can be replaced by green chilli if you want. You can add more veggies like capsicum or cauliflower if you want. A pinch of garam masala can be added too while sauting the vegetables. You can add tomato too while making the porridge. If adding add while sauting the onions. I was just wondering what to make for dinner that is very simple. I saw this and immediately made. My daughter also loved it. Thanks a lot. Love your recipes.